The arts are "a space where we can give dignity to others while interrogating our own circumstances," Darren Walker, president of the Ford Foundation, said at the museum's annual symposium, The Power of Giving: Philanthropy's Impact on American Life. Held on March 22, 2018, the program explored philanthropy's impact on and through culture and the arts. As he reflected on the relationship between giving and the arts, Walker said that "throughout our history, we have seen artists and activists work hand in hand. We have seen art inspire and elevate whole movements for change." As Walker suggests, music, storytelling, drama, and other arts have an emotional impact that motivates giving time and money to causes, while philanthropic appeals help artists attract audiences. To continue the conversation about the arts and giving, here's a look at three objects that tell stories about how Americans used the arts to promote social change in the 1800s. 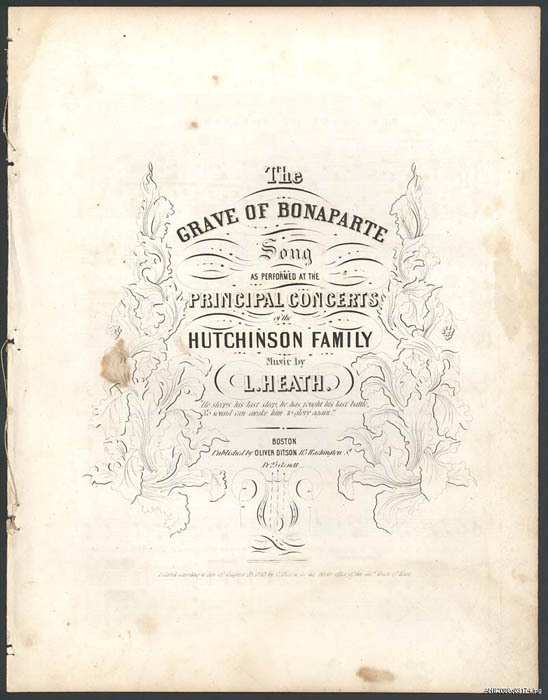 "The Grave of Bonaparte" sheet music, song and music by L. Heath, as performed by the Hutchinson Family Singers, Boston, 1843. "The Grave of Bonaparte," recalling the French leader who vanquished much of Europe before being defeated, reflected the Hutchinson Family Singers' concern for the cause of freedom abroad as well as at home. In the 1840s, the popular Hutchinson Family Singers from New Hampshire introduced music to the developing antislavery movement. As the sheet music for "The Grave of Bonaparte" suggests, the singers were concerned about freedom in other forms and many places, but they had their biggest impact on the American antislavery movement. Performing before integrated audiences, siblings Judson, John, Asa, and Abby—who were managed by their brother Jesse—helped nurture opposition to slavery among those not exposed to its evils. They also helped build far-flung antislavery networks thanks to their travel and the newspaper coverage of their events. Moreover, the success of their antislavery songs showed that the cause had commercial appeal. Works such as the novel Uncle Tom's Cabin would cater to that appeal–and help further develop antislavery sentiment. In addition to their contributions to reform causes, the group shaped American musical identity. At a time when Americans favored European musicians, the Hutchinson Family Singers spurred new interest in American music. Diorama of Fisk Jubilee Singers, made by Diedra Ball with assistance from Stephney Keyser in 1994–1998 based on an 1873 painting by Edward Havel. Gift of Diedra J. Bell and Dr. Stephney J. Keyser. After the Civil War, African Americans and sympathetic whites sought to create opportunities for African Americans to pursue higher education. For example, the American Missionary Association established Fisk University for African Americans in 1866. In 1871 the Fisk Jubilee Singers were organized. Using savvy marketing and publicity techinques to attract audiences, the group toured the United States and Europe fundraising for the school. The singers also advocated for African American rights and independence. Initially, they performed a range of the era's popular songs, but found that white audiences responded most strongly to spirituals. At a time when Americans still sought to establish cultural independence from Europe, many white concertgoers identified the spirituals as a distinctly American musical style. For their part, the singers themselves used the interest in their music to craft and manage their image in a society that either limited black roles or cast them in offensive, stereotypical imagery. 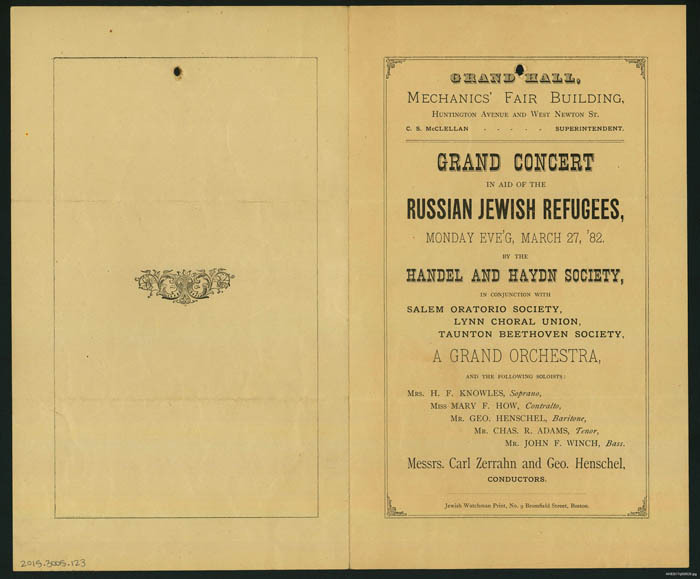 In the early 1880s, Russian Jewish refugees arrived in the United States fleeing brutal persecution at home. Newspapers around the country covered their plight and efforts to aid them. Using a common fundraising technique, supporters organized a benefit concert, featuring musical societies from Boston, Lynn, Salem, and Taunton, Massachusetts, to assist the refugees. A newspaper announcement about the event both encouraged people to buy tickets and tried to fight anti-Semitism by reminding readers that the Jewish community in Boston had often contributed to charitable efforts for others. As with other benefit concerts, the publicity around the event provided an opportunity not only to solicit support but also to foster reflection on societal challenges. As philanthropists today look to the arts to effect social change, these objects offer reminders about why the arts and activism have had such a close relationship for centuries. The long tradition of Americans using the arts to move people to support all manner of philanthropic endeavors has shaped American society by advancing causes while also shaping American culture by fostering appreciation for the arts. Want to learn more? Watch Walker's full keynote address and more videos from The Power of Giving: Philanthropy's Impact on American Life, our most recent symposium focusing on culture and the arts. You can find out more about these objects in Giving in America's online exhibit. Amanda B. Moniz is the David M. Rubenstein Curator of Philanthropy in the Division of Home and Community Life.